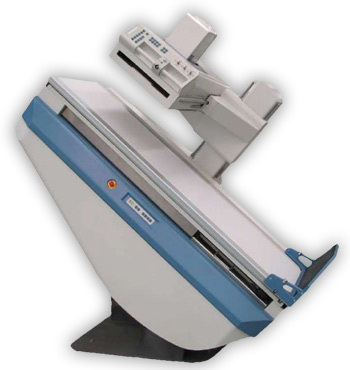 Classical complete set of the X-ray for RF provides simplicity and convenience in use, high quality of the images and X-ray shots. First workplace - Tilting table (TT) is equipped with electronic screen-imaging device with enabled function format-automatics. Screen-imaging device SID is equipped with front loading cassette's system with automatic centering. SID is able to use cassettes from 18x24 to 35x35 and image division 2-3-4-6-8. Rotate of the table to +90°/-15° by Trendelenburg. All movements of the table are motorized with microprocessor control. The control of table movements provides by using comfortable joysticks on the front panel of the SID. The second workplace - Tomographic table of the images is designed to perform direct and oblique pictures of patients in the "lying", "standing" and in the lateral positions, as well as for performing linear tomography. 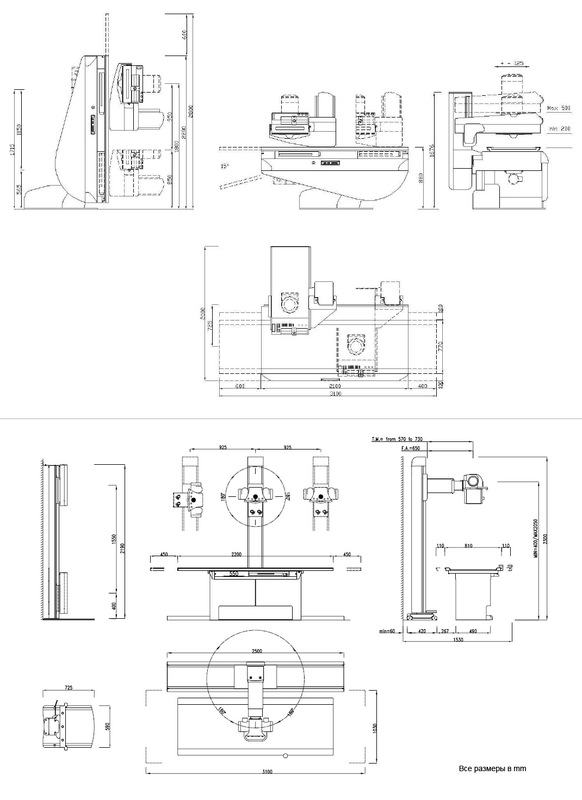 Also there is possible another variant of a complete set with digital x-ray image detector based on CCD-matrix or flat DR-detector based on a flat-panel. More information you can find on the page - RDK for RAD. Third workplace - Vertical image column (bucky stand) allows making images of the thoracic organs, as well as other radiographic images in a standing position. Bucky stands can be equipped with digital X-ray image detectors. More details in the section - RDK for RAD. The high-frequency power supply (X-ray generator). Standardly we use generators with capacity of 50 kW for RDK-VSM for RF. As an optional you can order a set with a generator 65 kW or 80 kW. For more details, see page - High Frequency X-ray generators. To complete our RDK we use X-ray tubes from imported manufacturers, well proven in operation. As standard, we use X-ray tubes from IAE (Italy). X-ray tubes which are used in our X-rays you can see in section - "X-ray tubes". Medical printers for obtaining hard copies of fluorograms on a special x-ray film (in the case of a complete set with digital X-ray image detector).